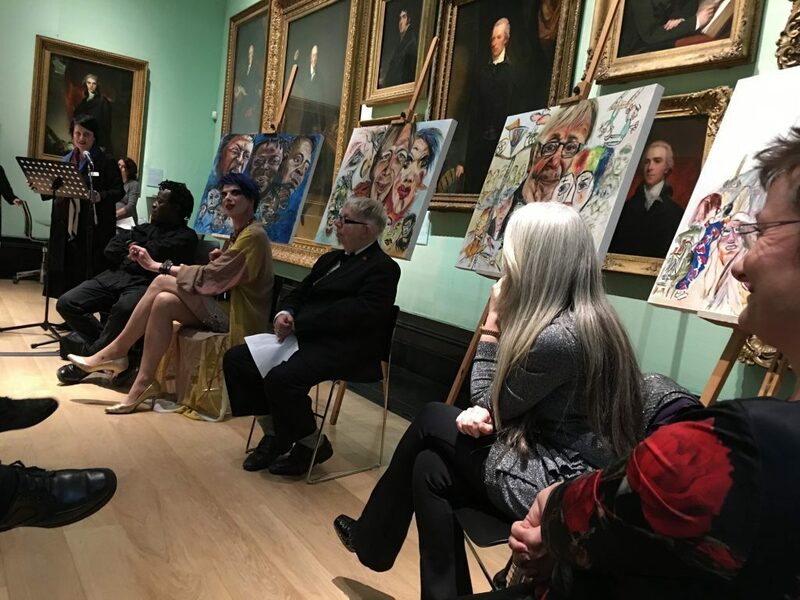 On 1 December, National Portrait Gallery played host to an event celebrating the culmination of Tanya Raabe-Webber’s Portraits Untold. The project saw four prominent cultural figures in Dame Evelyn Glennie, John Akomfrah OBE, David Hoyle, and Neil Baldwin sit for Raabe-Webber in four different cultural venues and have their portraits created using a combination of Raabe-Webber’s work and contributions from audience members who were invited to paint along with her. Review by Elinor Rowlands. 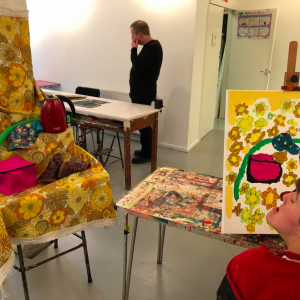 It was no coincidence that the room in which the conversation with acclaimed artist Tanya Raabe-Webber took place was filled with portrait paintings of people who had achieved greatness in their lives. All four sitters gathered together with their finished portraits behind them for the very first time, seeming to twitch with excitement as Producer Mandy Fowler led the panel discussion. Their portraits shone out like graffiti street art on canvas in front of darker earthier tones of the permanent collection. 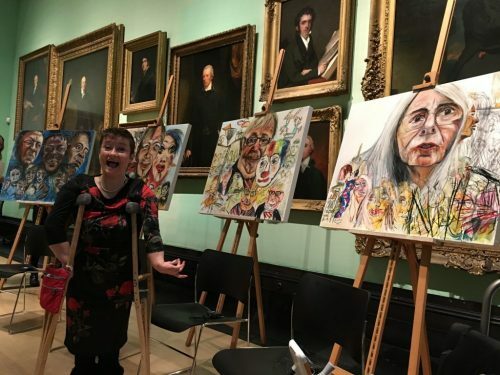 But it was the speeches by Liz Smith, National Portrait Gallery, Anna Mandlik, Arts Council England and Kate Mason, Big Draw whose words stood out first as they talked of a changing art world. Their provocations pointed to an acceptance of everyone’s art-making interpretation, and that Raabe-Webber achieved this through the use of technology, allowing an audience of all ages to “draw” the portrait of the sitter alongside her. The audience for each sitting had access to the art process using similar materials as the artist. It was not only about being able to make alongside the artist, but also about being given the space to make. Their interpretations of the sitter were included in the final portrait on canvas. The word ‘inclusion’ had been thrown around earlier in the speeches and panel debate, to my consternation. It’s a word that rankles with me in relation to disability as it insinuates making allowances, and evokes notions of pity; of inclusion ‘in spite of’ disability. But now it made more sense to me: Raabe-Webber was allowing the audience to make and create alongside her; every single mark made by audience members was accepted in the process of the portrait making. This for me was the compelling moment, where the diversity of what is art and the journey of its making is a common humanity of how society must treat all its citizens. This was a shared space to make, collaborate and be together. Their interpretations of the dynamic between each other and their experience of the space was also clearly defined on the canvas. One of the sitters, artist filmmaker John Akomfrah OBE whose work is often about power, defined this as symbolic of making the work surrender to the process. The power was no longer the artist dictating how the sitter should sit, and how the art would be interpreted in a particular way; Raabe-Webber handed this power to everyone in the room during the making of the portrait. Each person was able to imprint themselves into the portrait making. Similarly, performance artist David Hoyle dressed in drag, expressed how Raabe-Webber was one of the most important artists of our time. He expressed gratitude to be part this project, as it gave a platform to voices on the fringes of society, like the LGBTQ community, during these uncertain times. The National Portrait Gallery was profusely thanked and this made me wonder if there was a plea of despair of what is happening right now in the world with the rise of the far right. This collective struggle within the art world is needed more than ever. Raabe-Webber talked about the work as storytelling; that a portrait was an untold story and was not linear or straightforward, and so the artist should never approach it this way either. She smiled at us and her eyes widened as she explained that this project was only the beginning, that live portrait events were the vessel of being able to tell complex, strange and wonderful stories just like the characters of the four sitters in front of us. Each of the portraits raged against the surrounding traditional paintings behind golden frames. I was then struck by my earlier observation, that the paintings had graffiti/street art elements; that they carried voices, protests and complex thoughts; that they were as political as the sitters themselves, who were expressing their fears of our changing world. We need more artists like Raabe-Webber. 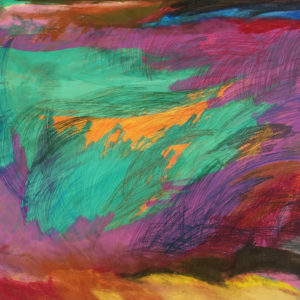 She effortlessly mixes the traditional and the technological; making use of both paints and an iPad. She combines these two worlds, while continuously being with her sitter and the audience in the moment. In many ways, she has embodied a collective unconscious and allows for this to be shown on canvas. She does not hide, she bears all. With this the story is clear, bold and awakening. 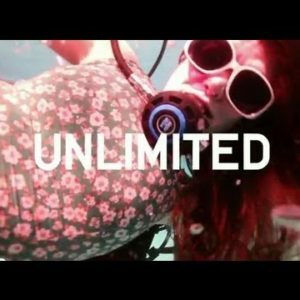 For more information about Portraits Untold, visit the dedicated website.